I just got one from Amazon (the blue SSR) and have tried it out twice. No matter where I set the thing up I can't get it to read consistently. Using the instructions literally I measured 8-10" away from ball with the 45 degree angle. I'm hitting from a flat, level grass tee. My readings on a 7i ranged from 62mph -> 88mph. The shots I was hitting were solid and reasonably straight but the radar readings are really where all over the place. I could hit two shots, back-to-back right at my target with near identical ball flight, but radar readings differed by more than 10mph. Not sure if I got a defective unit. I already printed a return label and plan to get a refund but I thought I'd inquire here to see if maybe I'm doing something wrong and give it one more try. I've got a red one being delivered tomorrow and I'll take it out tomorrow afternoon then post back here. I know what my numbers should be. My plan is to use it for driver swing speed training but I'll hit some irons with it as well. Most of the reviews I read had it doing what it's supposed to do. Nothing more, nothing less so we'll see. Let you know on Friday at the latest. Sorry, shipment came in a day late but got it out this afternoon. Same unit as yours with just tempo added. Hit a few wedges and all the numbers were good and moved on to a 6 iron. My 6 iron is normally 84-87 and SSRT was 78-81 and pretty consistent with that number. No issues really in my case since I bought it for the driver and the grass at the local muni range isn't the best lie to hit an iron off of. 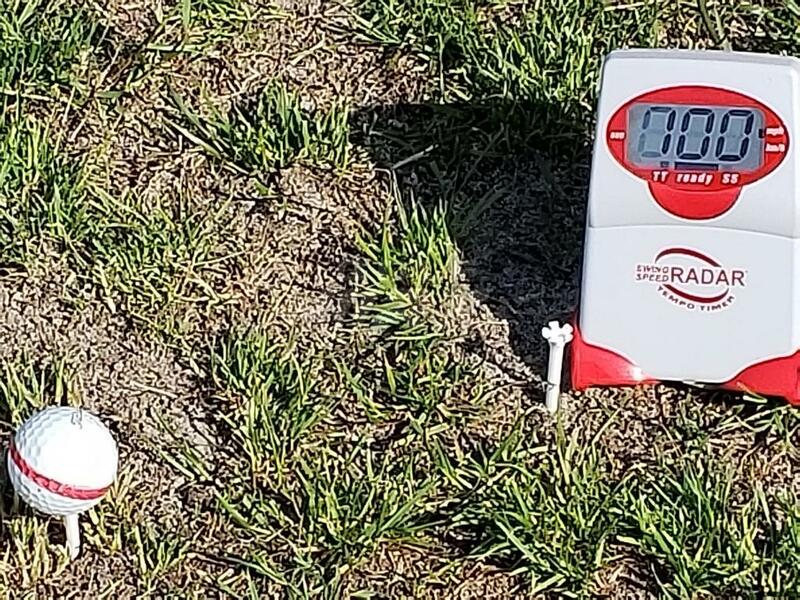 The 6 iron numbers were consistent just off a little and I need to see it on a better turf environment before making a judgement on the SSRT and irons. Moving on to the driver, it was really solid and numbers were spot on. Set up a a little diifferent than their instructions through trial and error . About 5-6 inches away worked best with the SSRT and about 1 inch ahead of a teed ball. More like 30 degrees instead of 45. Picked up 95-97 on my first swings and I was able to move it up to 100 through better tempo ( think Orange Whip) and better release at the bottom, NOT swinging harder just faster. I can see this helping on driver SS, not sure yet on how to use it with irons unless maybe a driving iron off a tee. Thanks so much for the detailed feedback. Pretty sure I got a lemon but I'll give it one more try before I return it. I have a Zepp 2 as well and it is usually 4-5 mph slower when compared to my Trackman numbers but my SSR is just all over the place. I'm gonna try setting up like yours and see if it helps. I get off numbers at times, and this usually works!